The University of Sheffield has released the early findings from an ongoing study looking at the use of tablets and apps by children aged up to 5 years old. You can learn more about the project, and download the report, here. 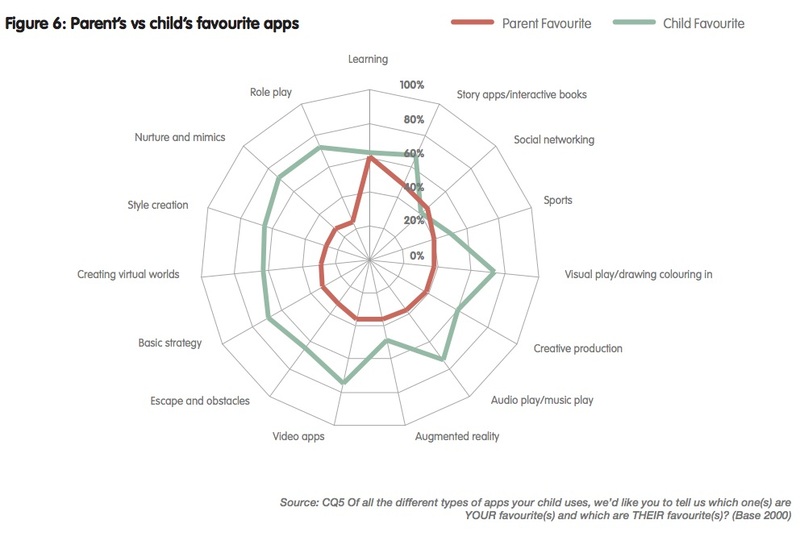 Some aspects of the study are debatable (e.g., the classification of the apps mixes different types of attributes like theme and functionality), and others not that surprising (e.g., parents’ main motivations for downloading apps are to support the child’s learning, and to encourage play and creativity). Nonetheless, other findings are novel and very interesting… at least to me. Two things caught my attention. The study shows not only how usage and motivation changes by age of the child, but also how it changes by day of the week, and even by time of the day. For instance, we find out that colouring apps are not only more popular among the 0-2 years old age group than among the 3-5 ones, but also that these apps are mostly used in the mid to late afternoon, with an adult. Likewise, we learn that while watching videos on YouTube is a popular activity across the age groups, the type of video changes by age group, and the motivation changes by time of day and by day of week. For instance, on a Saturday morning, parents of 0-2 years old will be looking at music videos on YouTube, with their children, as a way of encouraging creativity and play; but the same parents will be using music videos as a way of winding down in the evening. These insights are useful, for instance, if you are planning to advertise to this target market on YouTube. 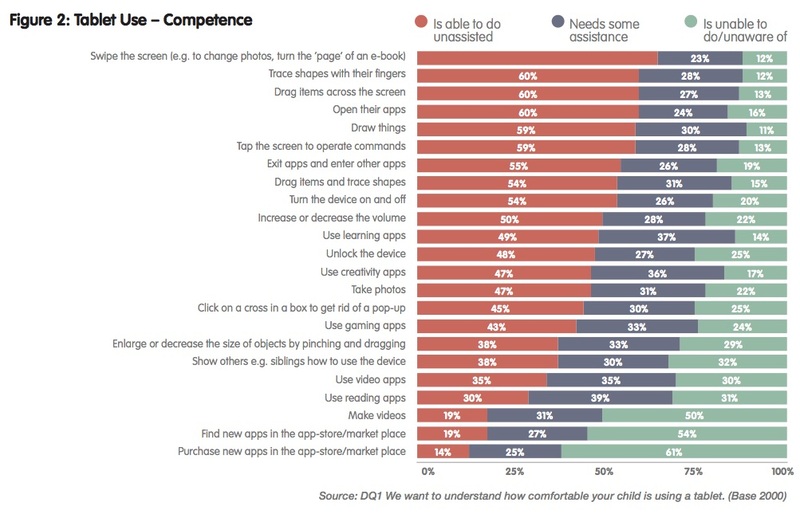 The study also looks at children’s competence in tablet use (see Figures 2 and 3 below), and what aspects they favour (Figure 6). For instance, we learn that as many as 40% of children aged 0-2 years old and 69% of children aged 3-5 can exit one app and enter another one. So, if children can change between apps independently, developers need to produce apps that are engaging, and which hold the children’s interest and attention. And, from Figure 6, we learn that this means apps that allow for audio and visual play. That is, developers need to go for multimedia apps, offering various layers of interaction to sustain interest. 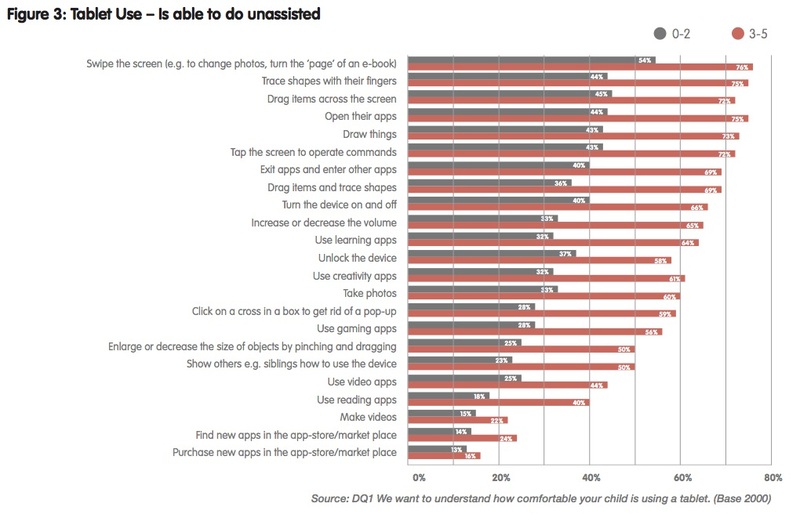 Moreover, since 60% of children aged 3-5 years old can take photos independently, and 22% can make videos (Figure 3), these young consumers can be engaged as co-producers in their use of the apps. This insight makes sense when we think about the success of products like Minecraft, or even Lego for previous generations. But also raises some deeper questions such as how these early online experiences shape these young users’ future expectations of digital (and non digital) products. It also raises questions around the involuntary generation of metadata about the children and their parents, and, of course, questions about online safety. What are your thoughts about young children’s use of tablets and mobile apps? Do you worry about your child’s digital footprint? Posted on August 6, 2015 August 2, 2015 by anacanhotoPosted in Marketing in everyday lifeTagged Children, Co-creation, Co-production, Digital footprints, Mobile app, Profiling, Tablets, Technology and Play study, University of Sheffield.